The Power Dome� LT can be recharged with your home's AC power or from your vehicle's DC cigarette lighter socket with the included adapters. 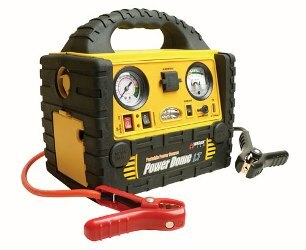 Keep it in your vehicle's trunk for those situations where you need to jump start your car battery or inflate your tires. This power supply also features AC, DC, and USB compatible power outlets so you can keep your favorite electronic devices running anywhere! Note: Recommended to fully charge 40-48 hours before initial use, after each use and every 2 to 3 months. 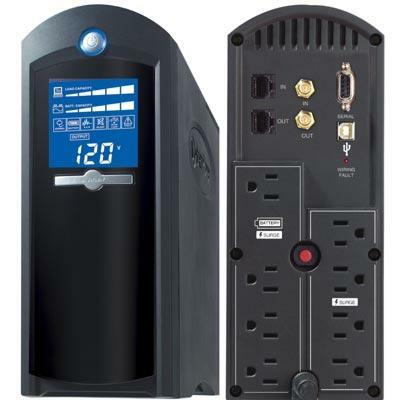 1500VA Intl UPS Omni Smart VS Tower Ext Run Line-Interactive 230V 8 outlets This item cannot be shipped to APO/FPO addresses. Please accept our apologies. 1500VA UPS LCD Battery Back Up Tower AVR 120V USB Coax RJ45. OMNI1500LCDT. 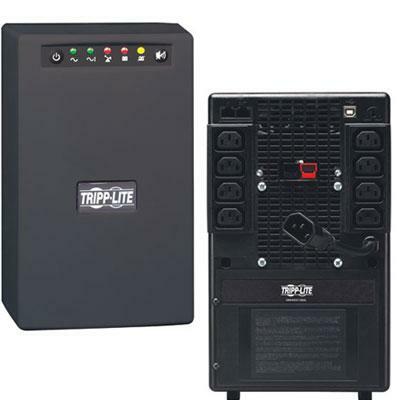 Tripp Lite's OMNI1500LCDT Line-Interactive Tower UPS System offers voltage regulation surge suppression and long-lasting battery support for personal computers network workstations home entertainment systems and media centers. Internal UPS circuits support entry-level PCs or individual VCR/DVR components during power failures. Prevents data loss viewing interruptions lost recordings and loss of component programming. Automatic Voltage Regulation (AVR) circuits continuously regulate brownouts and overvoltages from 92V to 150V back to usable levels all while maintaining a full battery charge. Offers complete power protection in an attractive all-black cabinet design. Includes 10 built-in outlets 5 with full battery backup and surge suppression for vital system components and another 5 with surge-suppression only for accessories not requiring battery support. Built-in USB port and included cable enables optional unattended system This item cannot be shipped to APO/FPO addresses. Please accept our apologies. 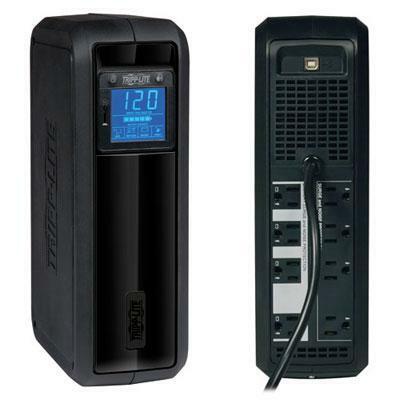 825VA/450W STANDBY UPS 8 x NEMA 5-15R OUTLETS LCD 3 YR WTY This item cannot be shipped to APO/FPO addresses. Please accept our apologies. 1300VA UPS Smart LCD Back Up Tower AVR 120V USB Coax RJ45. 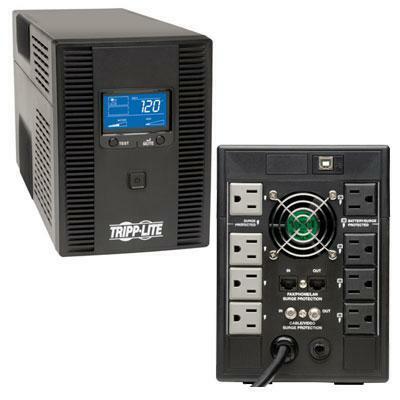 Tripp Lite's SMART1300LCDT Line-Interactive Tower UPS System offers voltage regulation surge suppression and long-lasting battery support for personal computers network workstations home entertainment systems and media centers. Internal UPS circuits support entry-level PCs or individual VCR/DVR components during power failures. Prevents data loss viewing interruptions lost recordings and loss of component programming. Automatic Voltage Regulation (AVR) circuits continuously regulate brownouts and overvoltages from 92V to 150V back to usable levels all while maintaining a full battery charge. Offers complete power protection in an attractive all-black cabinet design. Includes 8 built-in outlets 4 with full battery backup and surge suppression for vital system components and another 4 with surge-suppression only for accessories not requiring battery support. Built-in USB port and included cable enables optional unattended system shutdown without This item cannot be shipped to APO/FPO addresses. Please accept our apologies. SmartPro Rack/Tower UPS System- Black finish. Intelligent line-interactive network power management system. This item cannot be shipped to APO/FPO addresses. Please accept our apologies. The ECO650LCD ultra-compact green UPS offers complete protection from blackouts voltage fluctuations and transient surges. Interactive LCD user interface offers detailed UPS and site electrical data including input/output voltage estimated runtime remaining load percentage load wattage and battery charge level. Energy saving ECO outlets give users the option to automatically power off unused desktop accessories like a printer and audio speakers as the computer connected via USB goes to low-power sleep or shutdown modes. 99% full load efficiency rating offers energy savings and cool operating temperatures. Green eco-friendly design meets strict RoHS environmental standards. 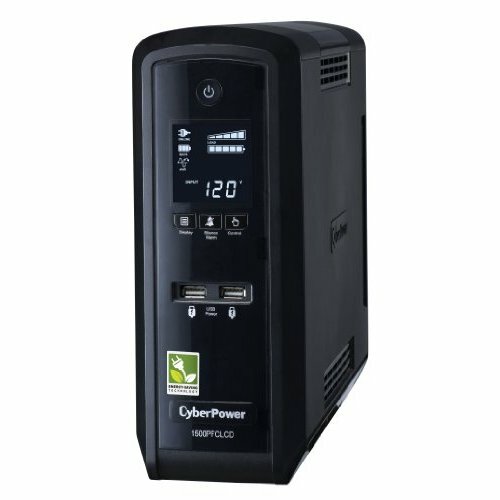 Provides uninterruptible transfer to battery derived AC output during power failures and voltage fluctuations with enough runtime to save and shutdown connected equipment without data loss. Space saving ultra-compact desktop or wall mount compatible housing. 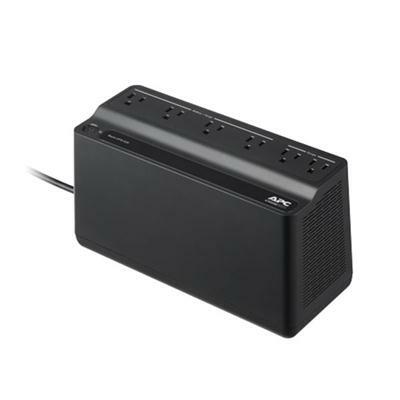 Includes 4 battery supported outlets for computer monitor and two vital syst This item cannot be shipped to APO/FPO addresses. Please accept our apologies. 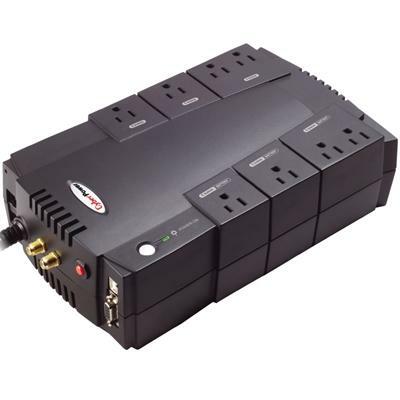 800VA/450W UPS 8 x NEMA 5-15R OUTLETS AVR 3 YR WTY This item cannot be shipped to APO/FPO addresses. Please accept our apologies. Tripp Lite's SMART1500LCDXL Line-Interactive UPS System offers network-grade voltage regulation surge suppression and long-lasting battery support ideal for network equipment phone systems desktop PCs and home entertainment systems. Uninterruptible Power Supply / UPS system provides battery derived AC output to maintain continuous operation of connected equipment without data-loss during power failures and severe voltage fluctuations. Runtime is expandable with one additional BP24V15RT2U external battery pack. 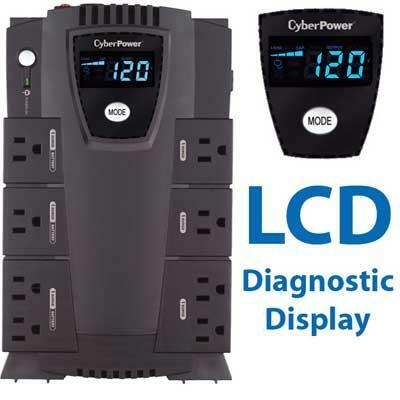 Interactive LCD display offers detailed site voltage and UPS status information plus a variety of UPS control options. High 97% efficient line power mode operation offers reduced UPS energy consumption and BTU heat output. Automatic Voltage Regulation / AVR circuits boost brownouts and reduce overvoltages from 75V to 147V to safe 120V nominal levels without using battery power. Included mounting accessories enable 2U horizontal rackmount installation in 2 and 4 post racks or upright tower installat This item cannot be shipped to APO/FPO addresses. Please accept our apologies. 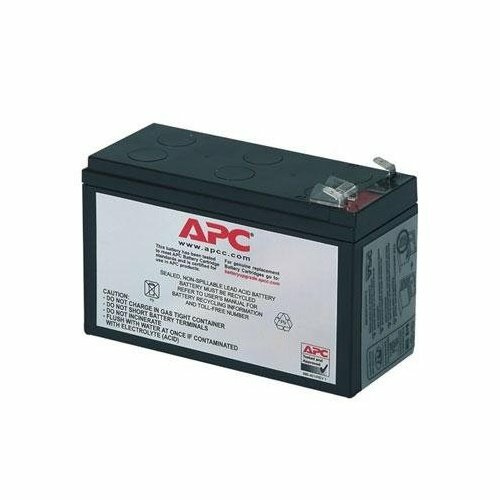 APC Replacement Battery Cartridge #109 This item cannot be shipped to APO/FPO addresses. Please accept our apologies. 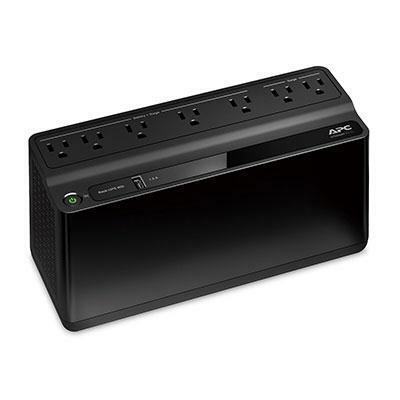 APC Back-UPS ES 850VA 2 USB charging ports 120V Replaces BE750G This item cannot be shipped to APO/FPO addresses. Please accept our apologies. 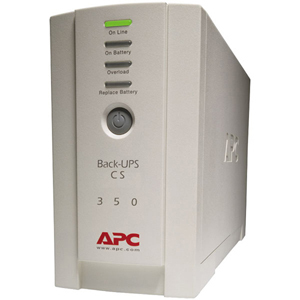 APC Back-UPS ES 600VA 120V 1 USB charging port Replaces BE550G This item cannot be shipped to APO/FPO addresses. Please accept our apologies. 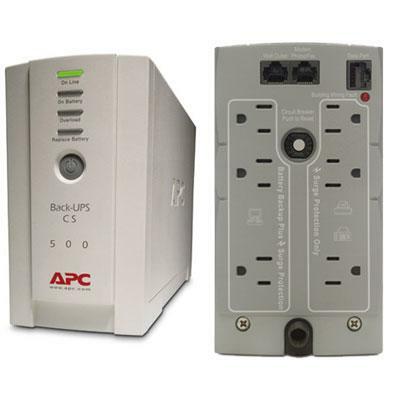 APC Back-UPS 650 8 Outlet This item cannot be shipped to APO/FPO addresses. Please accept our apologies. 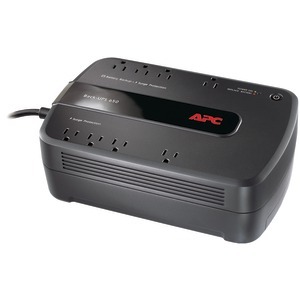 APC Back-UPS 6 Outlets 425VA 120V Replaces BE350G This item cannot be shipped to APO/FPO addresses. Please accept our apologies. 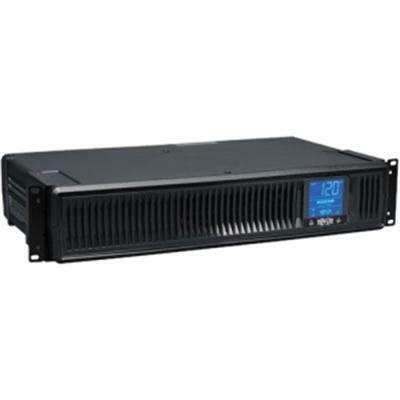 600VA/340W STANDBY UPS 8 x NEMA 5-15R LCD 3 YR WTY This item cannot be shipped to APO/FPO addresses. Please accept our apologies. APC Replacement Battery Cartridge #43. Replacement Battery Cartridges (RBCs) are user replaceable and hot swappable. Each RBC is a complete set of tested and charged batteries for your APC UPS. 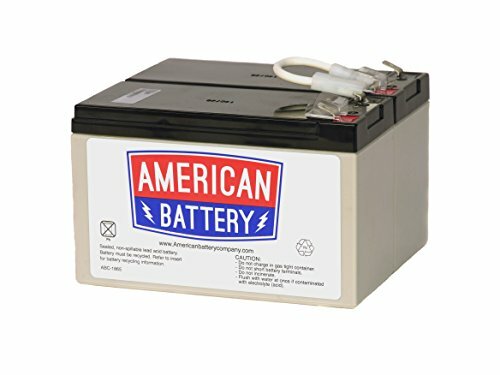 With the purchase of each RBC you will also get Free Freight back to APC for the disposal of your used batteries in the US. This item cannot be shipped to APO/FPO addresses. Please accept our apologies. 1500VA PFC UPS LCD. PURE SINEWAVE 10 OUT 15A AVR RJ11/45/COAX 3YR. 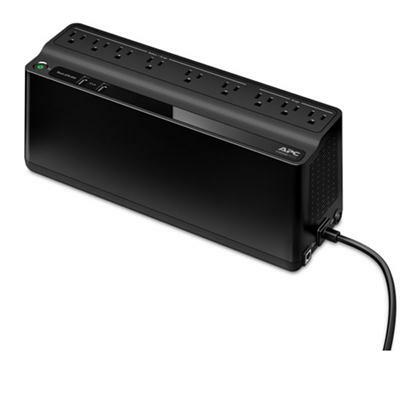 Compatible with Active PFC Power Supplies the desk top style UPSs that are used with many of the desk top computers. This item cannot be shipped to APO/FPO addresses. Please accept our apologies. Same as APC part # BR700G. Includes quarter long rebates. This item cannot be shipped to APO/FPO addresses. Please accept our apologies. 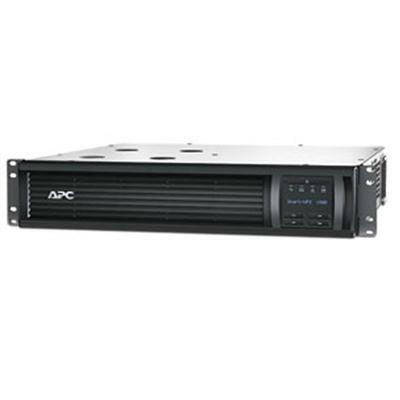 APC Smart-UPS 1500VA LCD RM 2U 120V with SmartConnect This item cannot be shipped to APO/FPO addresses. Please accept our apologies. 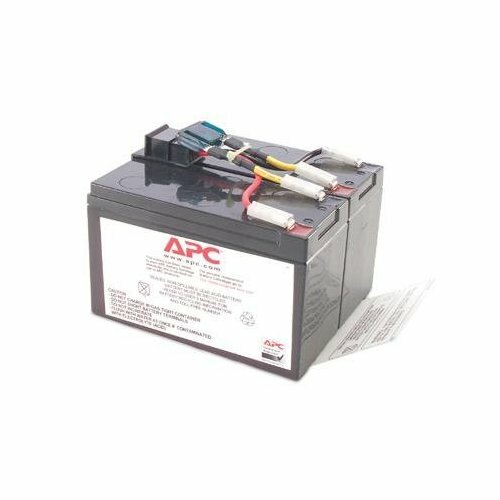 APC Replacement Battery Cartridge #48 This item cannot be shipped to APO/FPO addresses. Please accept our apologies. 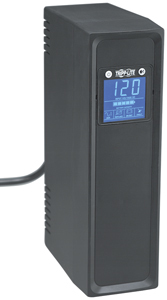 700VA 420W UPS Battery Back Up Tower LCD AVR 120V USB. Sealed Lead-Acid battery included. This item cannot be shipped to APO/FPO addresses. Please accept our apologies. Replacement Battery Cartridges (RBCs) are user replaceable and hot swappable. Each RBC is a complete set of tested and charged batteries for your APC UPS. 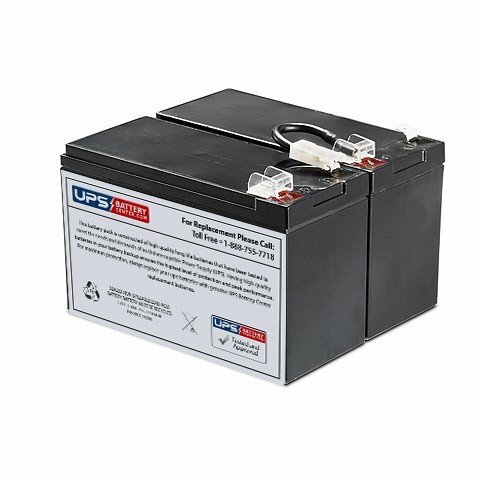 With the purchase of each RBC you will also get Free Freight back to APC for the disposal of your used batteries in the US. ***For FD orders only*** Can remove cost adder at billing but must charge the customer shipping. This item cannot be shipped to APO/FPO addresses. Please accept our apologies. 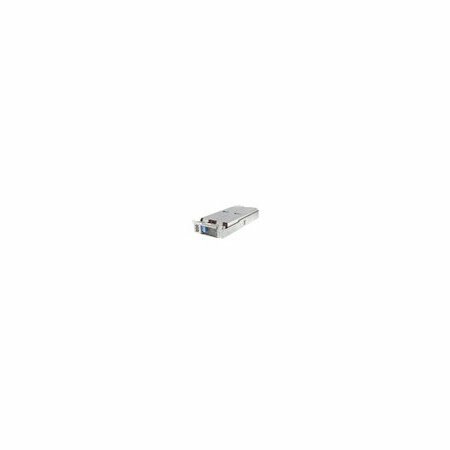 LINE-INTERACTIVE AVR 10 OL 1500J This item cannot be shipped to APO/FPO addresses. Please accept our apologies. 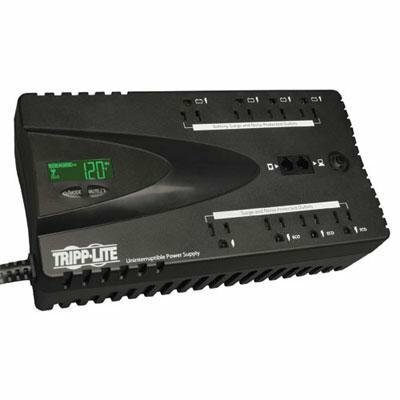 Tripp Lite's OMNIVS1000 line interactive UPS system offers voltage regulation surge suppression and long lasting battery support for personal computers internet working equipment and other sensitive electronics. This item cannot be shipped to APO/FPO addresses. Please accept our apologies. Protect your servers switches routers and networking devices with the Smart-UPS SMT750C with APC SmartConnect the first cloud enabled UPS for distributed IT. 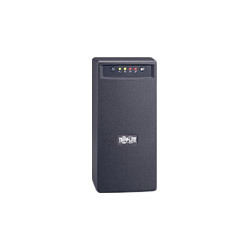 The SMT750C UPS provides backup battery power in the event of a power outage while safeguarding your equipment from harmful power conditions spikes and surges. The included service-free cloud monitoring feature is accessible from any internet connected device and maximizes the life and performance of your UPS by providing proactive advice and life cycle recommendations so you can remotely monitor your power infrastructure from anywhere in the world. Automatic green mode ensures you are operating at the highest levels of efficiency and intelligent battery management provides real-time monitoring and management through temperature compensated charging that extends the life of the battery. 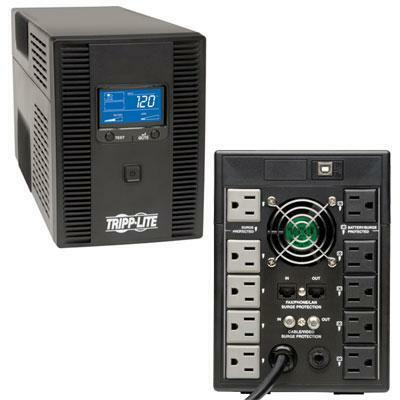 With 500-watt power capacity six battery and surge protected outlets and one switchable outlet group this UPS is ideal for small and medium sized-businesses. This item cannot be shipped to APO/FPO addresses. Please accept our apologies. 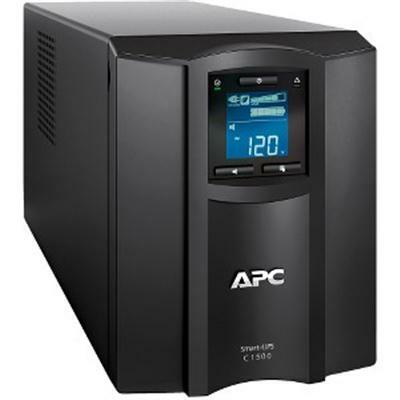 APC Smart-UPS C 1500VA LCD 120V with SmartConnect This item cannot be shipped to APO/FPO addresses. Please accept our apologies. 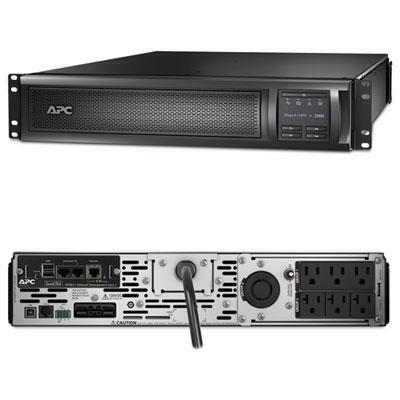 APC Smart-UPS X 1500VA Rack/Tower LCD 120V with Network Card. 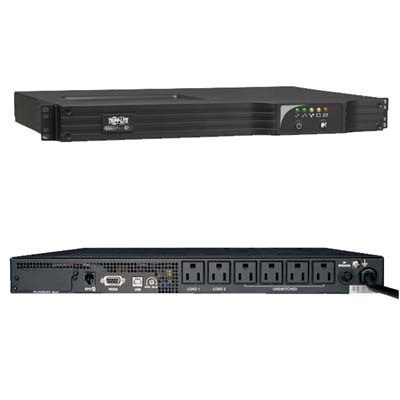 1200 Watts / 1500 VA Input 120V / Output 120V Extended runtime model Rack Height 2 U This item cannot be shipped to APO/FPO addresses. Please accept our apologies. 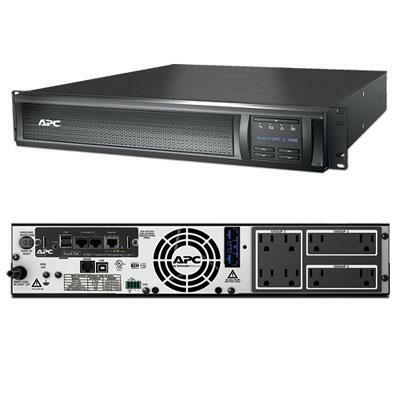 APC Smart-UPS X 2000VA Rack/Tower LCD 100-127V with Network Card This item cannot be shipped to APO/FPO addresses. Please accept our apologies.